These resources are intended as a starting point to learn more about visual supports and to offer templates and suggestions to begin creating your own visual support materials. You will need a PDF viewer for some of the resources – download Adobe Reader here. The Visual Supports Checklist (PDF) is based on a review of current literature, practical knowledge, and reported experiences from early childhood educators on the topic of visual supports. Developed by Susan Bennett-Armistead, Ph.D., University of Maine College of Education and Human Development; Bonnie Blagojevic, M.Ed., C.A.S., University of Maine Center for Community Inclusion and Disabilities Studies; Erika Neal, M.Ed., University of Maine Farmington; and Billie Taylor, MSW, LCSW, University of Maine Center for Community Inclusion and Disabilities Studies (June 2011, February 2016). 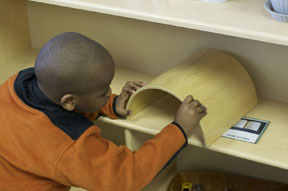 In the June/July 2011 NAEYC Teaching Young Children photo essay, “Take a Look! Visual Supports for Learning,” authors Blagojevic, Logue, Bennett-Armistead, Taylor and Neal define visual supports and show how they help all children to understand rules and expectations, engage in daily routine, navigate transitions, communicate thoughts, feelings and needs, and increase independence in child care routines and activities. NAEYC is the largest professional membership association for early childhood educators. ConnectABILITY – (Scroll down and click on Supported Inclusion and click “Launch”, then click on Communications, and select Visual Supports). Supported inclusion is a learning module for professionals. After launching the module, Visual Supports is a subtopic under Communications. Listen and watch workshops such as Visual Communications, access Tip Sheets, Communication Posters, and other tools. Creating and Using Social Stories – This Head Start Center for Inclusion web page provides general information about the purpose of social stories, when to use them, how to create and use social stories and offers a variety of ready-made social stories to download and use in the classroom. Tips and Ideas for Making Visuals to Support Young Children with Challenging Behavior (PDF) – This handout is from The Center on Social and Emotional Foundations for Early Learning, Vanderbilt University. Using Social Stories to Ease Children’s Transitions (PDF) – This article shares information about what social stories are, how to create them and gives examples such as how they can be used to help toddlers during transition times. Use Visual Strategies – Provides information regarding what visual strategies are, who benefits from them, and why they help. Explains the research behind why students with Autism Spectrum Disorder, behavior, and communication challenges benefit from visual strategies. Using Multimedia to Promote Vocabulary Learning: Supporting English Language Learners in Inclusive Classrooms – A recent research study shows that using multimedia video in conjunction with traditional read aloud methods may improve the vocabulary growth of English language learners. An example of how to implement multimedia during classroom read-alouds is described. Using Visual Supports with Infants and Toddlers (PDF) – Visual supports are a form of adaptation that rely on visual cues to allow infants and toddlers, and older child, to participate in activities and routines. This newsletter will take visual supports that have been used successfully in childcare centers and preschools and show how they can be used in the home with younger children. Visual Supports – This collection of visual supports and other resources from the Indiana Resource Center for Autism, provides examples of various strategies that can be used to support students on the autism spectrum, as well as others with and without disabilities. Classroom Visuals and Supports – This Head Start Center for Inclusion webpage supports teachers in the classroom by creating an ever-growing library of commonly used pictures and visual supports to help teach and support all of your students. From toys and art materials to daily schedule pictures, to even problem solving pictures and classroom certificates. The visual supports are downloadable and available to use immediately in your classroom. ConnectABILITY Visuals Engine – ConnectABILITY visuals engine helps to build custom visual supports and sequences for your child. Templates are available along with images to insert (and/or you can upload and insert your own) and a place to type in a title for the image. You can print the completed sequence from the web site. It provides a list of recommended sizes and different ways visuals can be used. Early Learning Activities & Visual Supports – The Frank Porter Graham Family Implemented TEACCH for Toddlers (FITT) project provides early learning activities and visual supports to teach toddlers with autism new skills and routines. These are highly visual activities that teach the toddler how to engage with toys (e.g., blocks, farm animals) and how to participate in play routines. The photo library provides examples of activities and visuals that FITT interventionists and parents created for their toddlers. Hands in Autism – The Practical Tools section of the HANDS in Autism site offers information on how to create visual supports and examples on topics such as Communication Supports, Social Skills Supports, Teaching Academic Skills, Transition Supports, and Self Monitoring. Picto-Selector – This is a free tool for creating visual schedules which you download to either a Windows or Mac computer. It is used by many teachers and parents. There are also reports of people using it in daycare of elderly people. Picto-Selector makes creating visual schedules easier by: 1) Fast search options to find the needed pictures; 2) Automatic sizes, depending on the number of rows and columns; and 3) Reuse of earlier created schedules. Picture Supports for Emergency Drills – Success Box – Picture card sets for five main emergency drills: Fire Drill, Bus Evacuation Drill, Tornado Drill, Lockdown Drill and School Evacuation Walk to Another School. These sets can be directly downloaded for printing or they can serve as examples from which you can create your own personalized sets with Boardmaker. resourceSET – resourceSET is a collection of downloadable visual supports that can be used by students for both receptive and expressive communication in the classroom, at home, and in the community. This searchable database allows you to find a wide range of useful visual supports for different curriculum areas, activities, and events. The collection involves all areas of study and is available to download. Social stories and comic strip conversations – Social stories™ and comic strip conversations are ways to help people with autism develop greater social understanding. Here, you will learn a bit more about these two techniques and how you can produce your own. Teacher Tools: Classroom Visuals and Support – This Head Start Center for Inclusion web page supports teachers to include children with disabilities more naturally in the classroom. These tools are designed to be able to print and go with quick and easy explanations. The ever-growing library of commonly used pictures and visual supports include templates that can be downloaded to use immediately to support children to learn how to problem solve, follow the daily schedule and make friends. Teaching Strategies: Using a Visual Schedule [Video] – Preschool teacher Patricia Lee describes how she uses a visual schedule to help children know what to expect throughout the day. Created by The Center for Early Childhood Education, Eastern Connecticut State University. Visual Schedules – Nearly everyone utilizes some form of visual schedule to stay organized. Create visual schedules using the do2Learn™ website. Requires paid subscription after a free trial. Suggest a resource and/or provide feedback or comments on your use of these resources to Linda Labas at labas@maine.edu. Please use “Visual Supports Resources” as your email subject line.